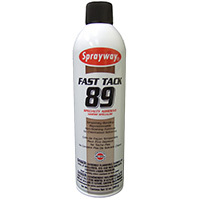 Sprayway Fast Tack 89 is a pressure sensitive mist adhesive intended for lightweight temporary bonds and repositionable applications. This adhesive has no permanent bonding capability. It has fast aggressive tack and good shear strength. When allowed to properly tack, the adhesive will not stain or transfer to other surfaces. 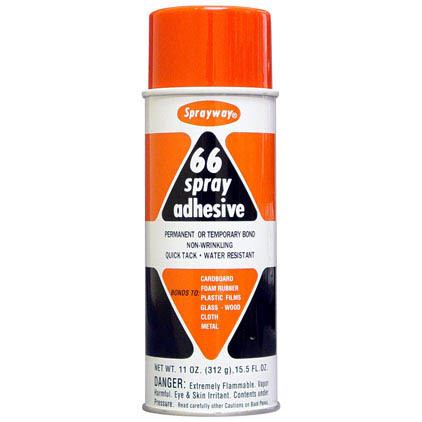 USES: This specialty adhesive is ideal for use for temporary fabric holding, arts & crafts, paste up and set up applications, palletizing lightweight objects, attaching appliqués, temporary signage and other similar applications.